After a long night of dancing, Cinderella wanted something a little more comfortable than those glass slippers. It was after midnight, the mice were fast asleep and the Fairy Godmother was off-duty. Ever resourceful, Cinderella grabbed her knitting needles, a pattern dictionary, and some yarn. She sat down and started to knit. Never one to construct a garment in the usual way-- after all, the woman has a mouse for a seamstress-- she came up with a seamless, two-needle sock. 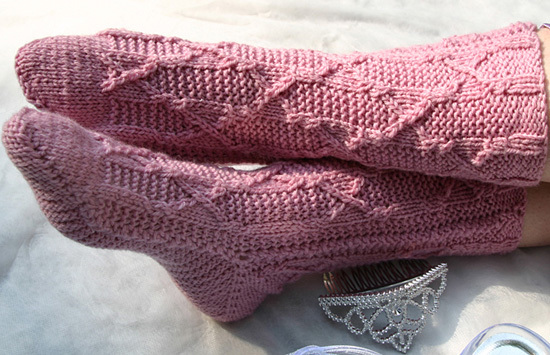 Inspired by the regal Heraldic Pattern in Barbara Walkers Second Treasury of Knitting Patterns, Cinderella started at the top of the cuff, worked down the shin, over the tip of the toe, down the sole and heel in reverse stockinette, then finishing with the calf and cuff. A Princess Sole, she dubbed the bottom of her unique sock, smooth and soft enough for even that princess with the well-known pea problem. By morning she had a pair. By tea-time, she was Mrs. Prince Charming. Cold marble palace floors feel great in wool socks. Note: Knitted as written, the pattern has approximately 0.5 inch negative ease. Circumference may be adjusted by changing needle size. Instep may be lengthened or shortened by working more or fewer pattern rows before beginning toe. In Heraldic Pattern with knitting relaxed, 24 sts and 32 rows measures 4.25 inches in width and 3.5 inches in length. LT (Left Twist): Bring right needle behind left needle and knit into back of second stitch on left needle without dropping st from needle; knit into front of first stitch on left needle, drop both stitches from left needle. RT (Right Twist): K2tog but do not drop sts from left needle, knit again into first st on left needle, drop both stitches from left needle. RJ (Right Join): Insert right needle from right to left behind both legs of slipped selvedge st, pick up and k 1 st. Place this st on left needle and knit it together with next st.
LJ (Left Join): Slip last st of row to right needle. Insert left needle from left to right behind both legs of slipped selvedge st, pick up and k 1 st. Insert left needle into fronts of last 2 sts on right needle and knit them together (as if working a ssk). Using Provisional Cast On, CO 26 sts. Row 1 [RS]: Sl 1 wyib, p2, [k2, p4] to last 5 sts, k2, p2, k1. Row 2 [WS]: Sl 1 wyif, k2, [p2, k4] to last 5 sts, p2, k2, p1. Repeat these 2 rows twice more, then work first row once more. Row 1 [WS]: Sl 1 wyif, work first row of chart, p last st.
Row 2 [RS]: Sl 1 wyib, work next row of chart, k last st.
Continue in pattern as set, working central 24 sts following chart and selvedge sts as set, until all rows of chart have been worked twice (64 pattern rows in total). Use split ring markers or safety pins to mark each end of last row worked. Work 32 rows of chart once more. Note: The upper toe (Rows 1-16) is worked in stockinette st. The underside of the toe (Rows 17-32) is worked in reverse stockinette st.
Row 1 [WS]: Sl 1 wyif, p2tog, p to last 4 sts, p2tog, W&T. 24 sts. Row 2 [RS]: K to last 2 sts, W&T. Row 3 [WS]: P to last 3 sts, W&T. Row 4 [RS]: K to last 3 sts, W&T. Row 5 [WS]: P to last 4 sts, W&T. Row 6 [RS]: K to last 4 sts, W&T. Row 7 [WS]: P to last 5 sts, W&T. Row 8 [RS]: K to last 5 sts, W&T. Row 9 [WS]: P to last 6 sts, W&T. Row 10 [RS]: K to last 6 sts, W&T. Row 11 [WS]: P to last 7 sts, W&T. Row 12 [RS]: K to last 7 sts, W&T. Row 13 [WS]: P to last 8 sts, W&T. Row 14 [RS]: K to last 8 sts, W&T. Row 15 [WS]: P to last 9 sts, W&T. Row 16 [RS]: K to last 9 sts, W&T. Row 17 [WS]: K7, W&T. Row 18 [RS]: P8, W&T. Row 19 [WS]: K9, W&T. Row 20 [RS]: P10, W&T. Row 21 [WS]: K11, W&T. Row 22 [RS]: P12, W&T. Row 23 [WS]: K13, W&T. Row 24 [RS]: P14, W&T. Row 25 [WS]: K15, W&T. Row 26 [RS]: P16, W&T. Row 27 [WS]: K17, W&T. Row 28 [RS]: P18, W&T. Row 29 [WS]: K19, W&T. Row 30 [RS]: P20, W&T. Row 31 [WS]: K to end. Row 32 [RS]: P11, m1, p2, m1, p11. 26 sts. Row 2 [RS]: RJ, p to last st, LJ. Repeat these 2 rows until you have joined all instep rows, ending with the second-last row before the marked row. Row 1 [WS]: Sl 1 wyif, k to last 2 sts, W&T. Row 3 [WS]: K to last 3 sts, W&T. Row 4 [RS]: P to last 3 sts, W&T. Row 5 [WS]: K to last 4 sts, W&T. Row 6 [RS]: P to last 4 sts, W&T. Row 7 [WS]: K to last 5 sts, W&T. Row 8 [RS]: P to last 5 sts, W&T. Row 9 [WS]: K to last 6 sts, W&T. Row 10 [RS]: P to last 6 sts, W&T. Row 11 [WS]: K to last 7 sts, W&T. Row 12 [RS]: P to last 7 sts, W&T. Row 13 [WS]: K to last 8 sts, W&T. Row 14 [RS]: P to last 8 sts, W&T. Row 15 [WS]: K to last 9 sts, W&T. Row 16 [RS]: P to last 9 sts, W&T. Row 32 [RS]: RJ, p to last st, LJ. Row 1 [WS]: K1, work first row of chart, k last st.
Row 2 [RS]: RJ, work next row of chart, LJ. Continue in pattern as set, working central 24 sts following chart and joining selvedge sts on RS rows, until all rows of chart have been worked twice. Row 1 [WS]: K3, [p2, k4] to last 5 sts, p2, k3. Row 2 [RS]: RJ, p2, [k2, p4] to last 5 sts, k2, p2, LJ. Break yarn, leaving a tail at least 1yd long. Remove waste yarn from CO edge and place sts on st holder or spare needle. BO all sts using Sewn Bind Off, binding off sts on working needle first, then sts on holder or spare needle. 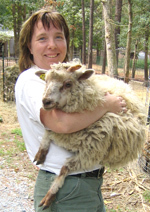 When she doesn't have needles or spindle in hand, she can be found caring for her young son, Curly-Top, three dogs, two cats, a rabbit and a couple of Shetland sheep. Someday, she will knit her husband socks. Follow her continuing adventures here.